Graffiti cop cars with bullets! I enjoyed the big Tom Clancy's The Division reveal at E3 this year. 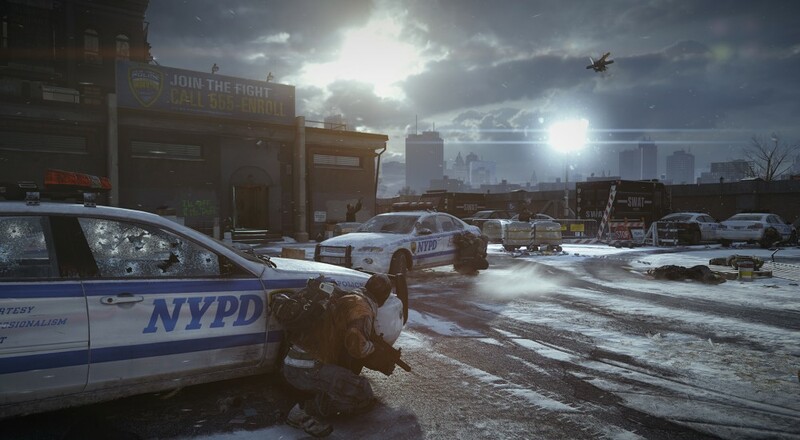 Seeing the tattered landscape of post-apocalyptic New York pull back to reveal the vastness of this multiplayer 3rd person shooter was definitely a highlight of the show for me. The concept of a disease spreading on Black Friday sounded less like a coherent plot and more like a cautionary tale against American greed, however. The big VGX show went down this past weekend, and with it was a rundown of The Division's in game engine, called Snowdrop. Take a gander at some of the effects this puppy can pull off. We don't see a whole lot of action coming from this piece, but I'm kind of a sucker for engine punch lists. The snow and weather effects look really great, and that's a great way to keep areas looking fresh even after you've seen them time and again. The real value for my money is the destructible terrain. Firing through the wood of that sign and seeing light cascade through the bullet holes was pretty cool. Lots of games let you shoot out car tires, but straight up procedural destruction is a (sadly) all too rare concept. Alright Ubisoft, color me impressed. I don't expect any hardened survivors will take time out of their scavenging to make snow angels, but it's definitely pretty cool that they could if they wanted to. I wonder what Mr. Clancy would think upon seeing his name tacked onto a product where someone can make street art with an uzi.